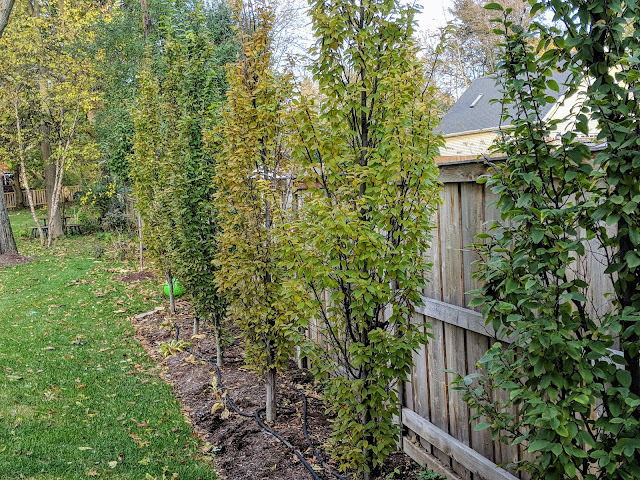 Back in May of this year, we planted a hedge of seven Frans Fontaine European Hornbeam trees along the fenceline on the northside of our property right outside of our screened porch. These are trees that I had researched and dreamed about since we moved in. Prior to their installation, I documented what the 'view' was like of the space where they were going in April (when there was still a little bit of snow on the ground) and then again in late May, right before they were planted. I tried to baby them all Summer and with the help of a couple of soaker hoses, I tried to keep them happy and hydrated. I most recently visited these trees in late August when I posted this photo of the 'late Summer' view of the hedge. I've noticed that all seven of the trees have handled their transplant differently. Some of them have done just fine. A few have even shot up leaders at the top. One of them seems to be growing wider at the top than others, which is interesting. And a few have seemed to kind of 'thin out' in the middle with some dead/dying branching in parts. We planted them about six feet or so apart and after the five months they've been in the ground, the gaps between them are NOT any noticeably closer together. But, I mean...come on. What would you expect, right? All of them seem to have made it through their first season in moderately good shape. And that brings us to now: Fall. And they're starting to turn from a deep green to a really nice yellow. You can see them in the #nofilter photo above that they're moving in slightly different timelines. I'm posting this on November 11th, but this photo was taken on October 30th. Just recording that for the [garden diary] perspective as by now these trees have turned even more. The tree on the far right of the photo (closest one) is still totally green, but as you move away, the next few are showing some yellow. And if you look on the ground, you'll see some leaves, but not very many of them are from these Hornbeams. There's mixed debate about the marcescence of these trees. What's Marcescence? Marcescence is the retention of dead plant organs that normally are shed. Someone over on the Houzz boards said that the Frans Fontaine Hornbeam "are about the most marcescent tree I have ever seen." That means that they'll keep their dead leaves on the branches all winter. Usually until the new leaves begin to bud. I've seen it with some of our Flowering Pear Trees. They do the same thing. Hold onto a bunch of brown leaves all Winter. I don't mind it, but I could see some folks objecting to it? Since we're using them primarily as a screening tree, I'm not opposed at all to the dead leaves. But, we don't need the screening as much in the Winter as we aren't spending too much time out back or in our screened porch. I'll keep an eye on these trees this Fall to see what they do in terms of full 'show' as well as marcescence.